You can watch the self titled Oompa loompas make stone ground chocolate as you sip your dark hot chocolate at Chocovivo. I have a penchant for picking out the most expensive products at farmer’s markets. Whether it’s raw honey, organic pomegranate juice, or avocado hummus, I’m a sucker for specialty artisanal foods. By far one of my greatest weaknesses is for good quality, vegan dark chocolate—and it just so happens that my local farmer’s market is happy to oblige in the form of Chocovivo, a small artisanal chocolate making company that makes minimally processed, stone-ground chocolates free from dairy, soy lecithin, and refined sugars. While I typically buy Chocovivo chocolate at the farmer’s market (they maintain a stall at the Culver City market on Tuesday evenings, and one at the Mar Vista market on Sunday mornings), the company also has a small storefront on Washington Boulevard where they host chocolate tastings (awesome! ), both of solid chocolate and assorted hot and iced chocolate drinks as well. 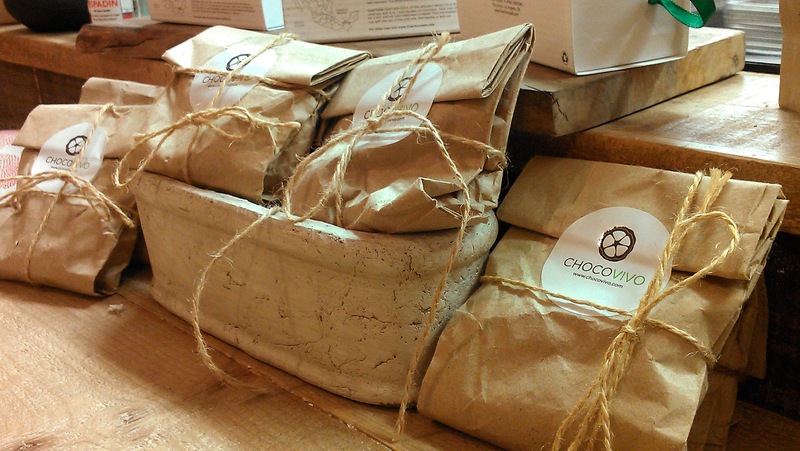 Chocovivo chocolate bars lining their adorable store shelves, and also available at local farmer’s markets. One evening I just couldn’t hold out anymore, and I convinced by boyfriend to accompany me on a chocolate tasting adventure. Even before you enter Chocovivo, the storefront lures you in with its warm, rich lighting and whimsical wooden décor. Is it a wine bar? Tapas bar? Nope! It’s all about the chocolate in this place! 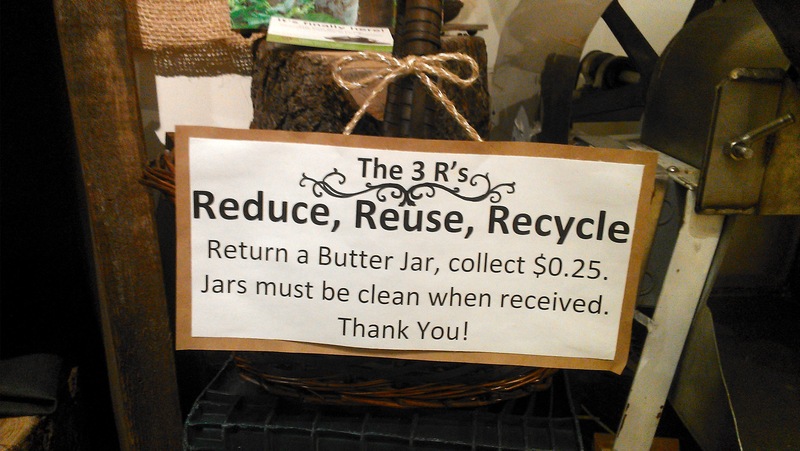 When I entered the shop, I felt like Dorothy leaving Kansas (a.k.a. Culver City) and landing in Oz (a.k.a. magical chocolate land). Or many Willy Wonka’s chocolate factory, but with none of the weird song/dance numbers or snotty children–although they do call the chocolate makers Oompa Loompas here. Hand packed chocolates in adorable bags. No, this is a very adult type of candy store—where couples sit closely on bar stools made out of tree stumps, leaning in towards each other as they share a thick, indulgent cup of dark hot chocolate, or sample a platter of various home-made cacao concoctions. Lining the walls are various cacao products for sale, including the chocolate bars—in myriad flavors—that Chocovivo is perhaps most well-known for. 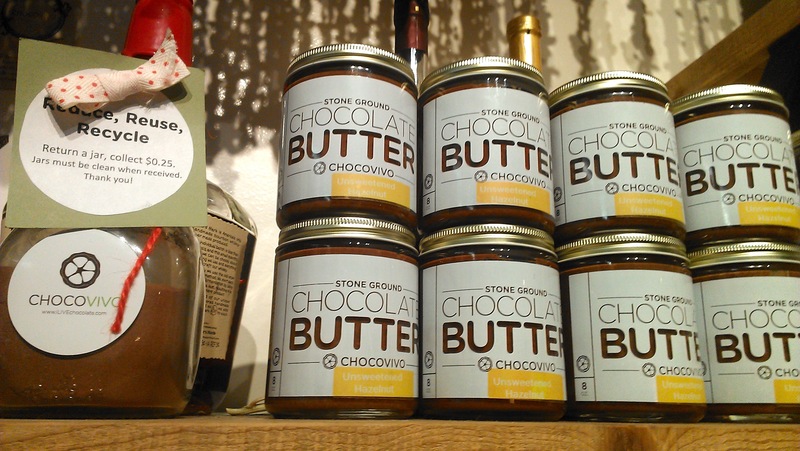 Also for sale or hand filled bags of raw cacao nibs, cacao powder, and chocolate spreads. It was hard to keep my cool when all I wanted to do was try IT ALL. It turns out, you pretty much can. One of the menu options is a chocolate sampler (along the lines of a wine or beer flight, or cheese sampler)—you can choose how many chocolates to sample, all the way up to the max, which is thirteen (I’ll give you one guess which option I went for!). I had my partner in chocolate crime with me, so I figured we could handle it. Our helper removes pieces of chocolate from the magic chocolate drawer. Patricia, the owner, is in the background. 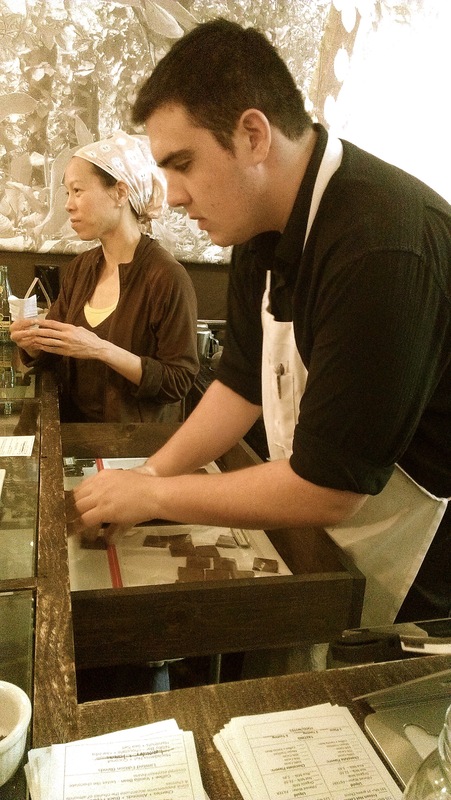 As the store assistant began pulling open drawers behind the counter and removing various pieces of chocolate to line our plate, he explained the process of harvesting, fermenting, roasting, and grinding the cacao to turn it into the bars, powders, and spreads before us. Chocovivo does not use any sort of heat processing—a step most chocolate producers use to maximize efficiency—they just grind the cacao using traditional lava stones, then mix in pure unrefined can sugar and whatever flavors they are using for each type of chocolate bar. 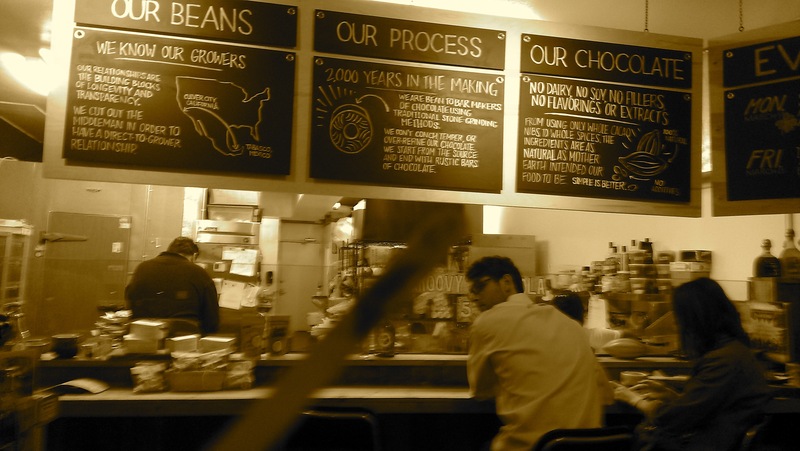 Their website explains the process, and their relationship with cacao farms, in more detail. The result of their approach is a high quality chocolate that retains much more of the natural nutrients, as well as flavor, contained in cacao beans. 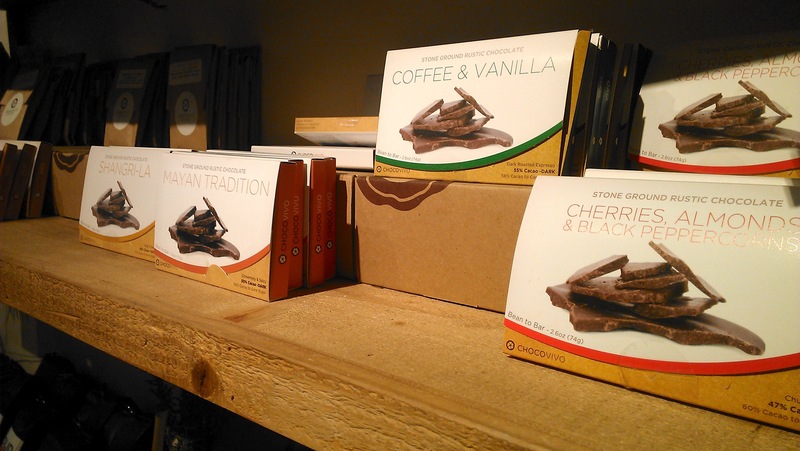 Chocovivo chocolates are all vegan, natural, organic, with no additives (e.g. soy lecithin, cocoa butter, etc.). 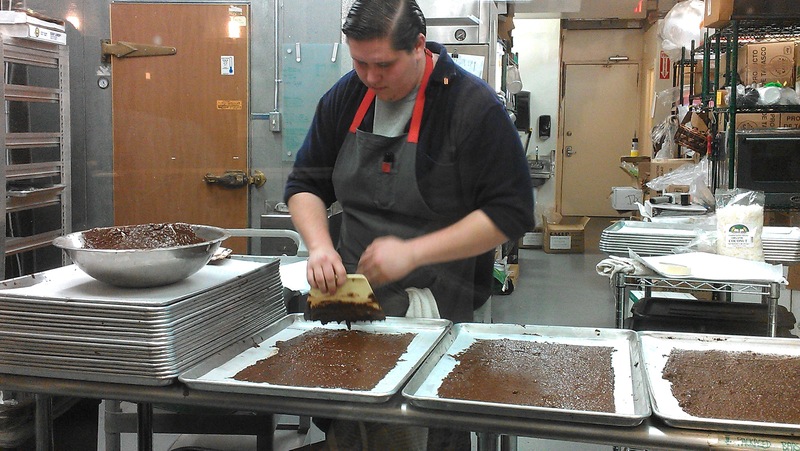 Spreading the stone-ground chocolate so it will solidify into bars. For someone who has never tried minimally processed chocolate before (or dark—I’m talking 80% chocolate), Chocovivo may take some getting used to. The bars have a slightly gritty texture, from the pure ground cacao beans, and a rich, slightly bitter flavor that is non-existent in processed milk chocolate—because milk chocolate has barely any real chocolate in it at all! Needless to say, the texture and the flavor are actually what draw me to Chocovivo. A little goes a long way—the two of us only made it through about half of our chocolate flight—but the complex flavors and textures are ooh-so-satisfying. Ready for that flight to heaven….chocolate heaven. 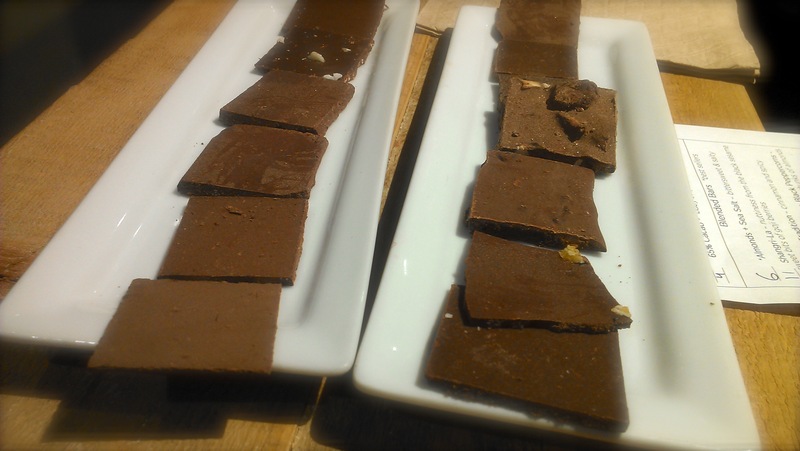 Included in our tasting flight were four types of plain dark chocolate (ranging from 60% to 100% pure cacao!). Of these, I’d have to say I preferred the 85%, followed by the 75%, which was just ever so slightly sweeter and milder. My boyfriend was more into the lighter side of dark, going for the 60%. Then came the blended chocolates: Almond with sea salt, Shangri-La (black sesame with goji berries), Mayan Tradition (cinnamon and spice), Cherry-almond and Black peppercorn, and coffee and vanilla bean. Each of these was intriguing in its own right, and it wouldn’t really be fair to rate them in any order. However, the Shangri-La is one of the most uniquely flavored chocolates I’ve come across, definitely worth a taste. I always love coffee flavored chocolate because of the contrast between sweetness and bitterness, and the cherry-almond flavor was satisfying on a number of levels. But we weren’t done yet. There were also the limited edition blends: Macadamia Nut and Coconut, Lavender and Lemon, Nibby Bar with raw cacao nibs, and Hazelnut and Sea Salt. Wow. Talk about an overwhelming array of flavors. We bravely took our time sampling each one and compared notes. The macadamia/coconut blend was the richest, the nibby bar was an all around winner with nice texture and flavor, but my favorite was the lavender/lemon combo—a slight perfumy fruitiness balanced with rich dark chocolate. Out of all of the thirteen flavors, the only one that fell flat, surprisingly, was the hazelnut/sea salt blend. Neither of us thought it compared to the rest—something about the flavor fell flat. Perhaps it was just a bad bunch of hazelnuts, or not the right balance of nuts to other ingredients. But it was the only bar out of the thirteen that I wouldn’t miss. Even though we couldn’t finish our chocolate flight, I felt it was my duty to try something else on offer, perhaps a warm chocolately drink. I also was looking for excuses not to leave this adorable sanctuary of a shop so I could continue to watch the oompa loompas (that’s literally what they call the chocolate makers at this shop) work their magic on the other side of the glass. So, ignoring my satiated stomach and my already-overloaded on polyphenols brain, I ordered a hot chocolate that blended a mix of dark and mayan spice with almond milk. As we waited for the drink, I watched the owner of the shop, Patricia, meet and greet various customers, explaining with passion the various aspects of her business and the sourcing of her chocolate. I worked up the nerve to approach her and chat for a few minutes, and even took a picture with her! It’s always rewarding to meet the entrepreneurs behind socially and environmentally forward-thinking ventures. Sipping on hot chocolate, trying not to neglect the chocolate in the corner. 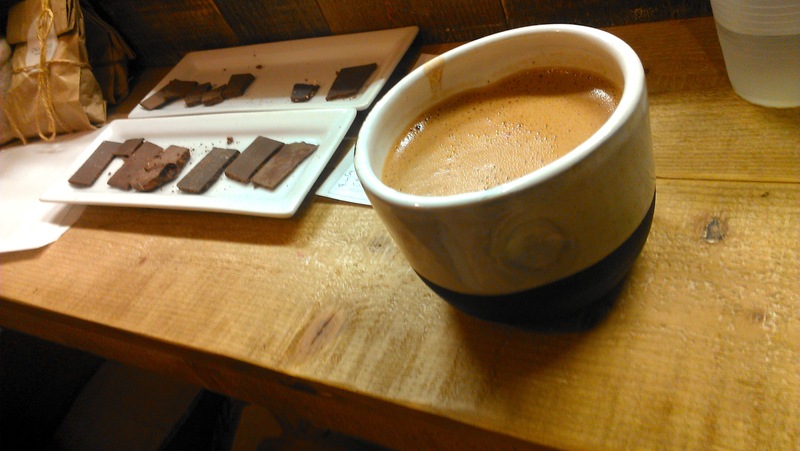 The hot chocolate was incredible; thick, rich, warming, soothing. But soooo intense after 13 other chocolate flavors! I tried to finish as much as I could (also pressuring the BF to help out), and eventually we slid off our bench seats, still in a chocolate stupor, and wandered out of the shop just before closing time (oh, and I definitely had a doggy-bag in hand with our un-eaten remnants of the chocolate flight). 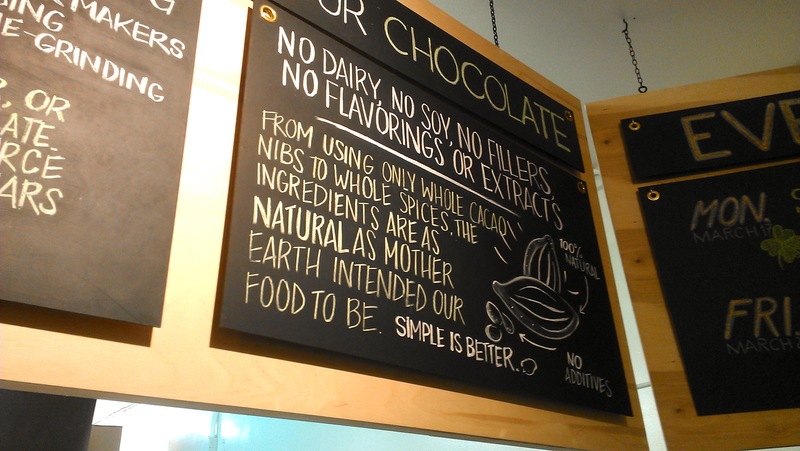 Lovin the sustainability ethic of Chocovivo. I had successfully fulfilled a lifelong dream of eating chocolate, and nothing but chocolate, for dinner; and supporting a wonderful local business while I was at it! Chocovivo is an absolutely perfect place to go on a cute first date, a romantic second, third, or hundredth date, or just to treat yourself or a friend to a hot (or iced) chocolate after a long week. And if you are serious about your dark chocolate love affair, Chocovivo is your answer to satisfying that craving in a healthier, more sustainable, and enjoyable manner. 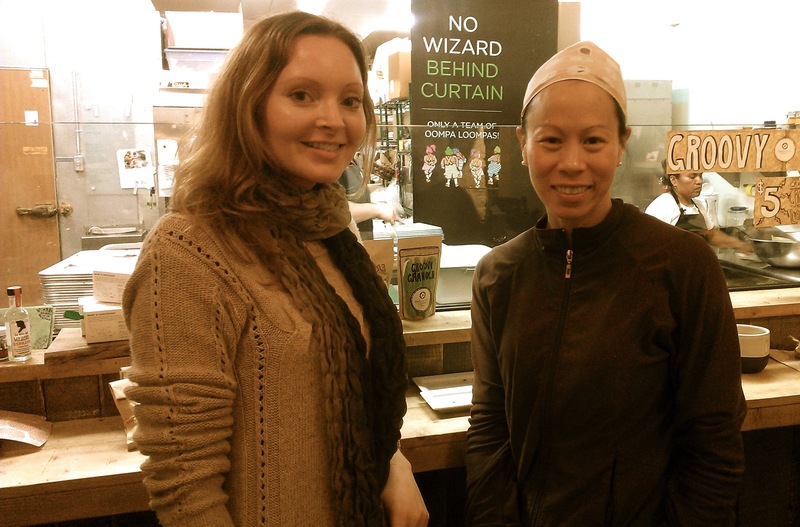 Getting to meet Patricia, Chocovivo’s owner, was an extra sweet treat! There are way too many varieties for me to provide individual ratings, but you can get the gist of my preferences above. However, here is my overall rating for Chocovivo chocolates. 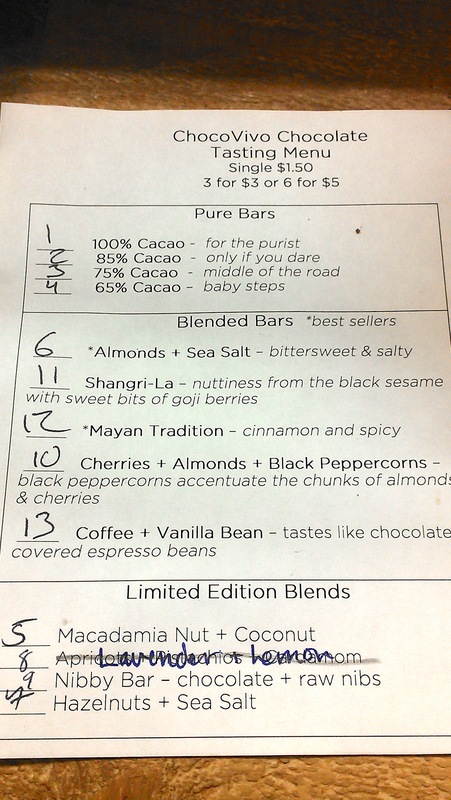 Posted on May 13, 2014, in Cafe, Chocolate, Desserts and tagged cacao, cafe, chocolate, chocolate tasting, Chocovivo, Culver City, hot chocolate, los angeles, organic, sustainable. Bookmark the permalink. Leave a comment. Hi and Bye Hawaii...time to hit up some dive sites in Palau! See you in two weeks, internet.